Since 2000 ShelterBoxes have saved families in more than 90 different countries. 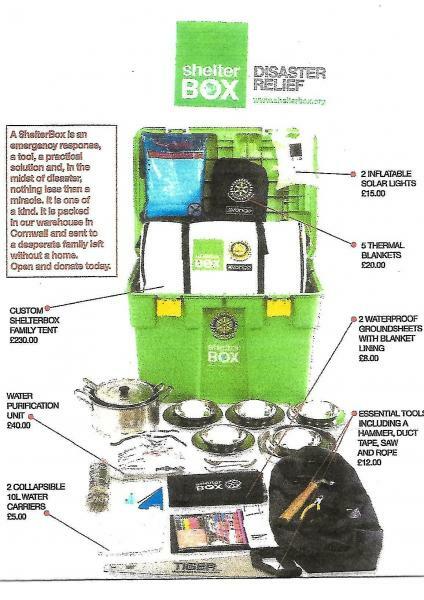 Our Club makes a yearly donation from our Charity Fund to ShelterBox Disaster Relief. Since 2000 Shelterboxes have saved families in more than 90 different countries, including Nepal,the Philippines, Japan, Lebanon, Haiti, Afghanistan, Turkey, Malawi, Vanuatu, Korea,Myanmar and Sri Lanka.